I have been racking my memory banks to try to figure out if I have ever actually read an E-magazine. I think I have once. Or it might just be that I backed one on Kickstarter, and down loaded it, but never really read it. My lack of being able to organize my time efficiently has kept me from doing any reading at leisure for a long time. Once an avid reader, I no longer pay attention to what books are out, magazines that are related to my passions, or the classic book checklist that I haven’t scratched anything off in years. I keep telling myself that one day I will make time. With that said, I am not sure what caught my attention when I read about Definition Magazine, especially since it has been even longer since I have done anything close to what would be considered a work out. Maybe it started a day-dream about a past life when I had time to work out for afternoons at a time, practice yoga or actually worried about my body image. Or maybe, actually more likely, it was the fact that is a magazine put together by vegan women for the vegan woman and the topic is about something I was once very passionate about, getting fit. The idea of the magazine inspired me enough to reach out to Dani Mouser, of Sweet Potato:Plant-Powered Health Coaching and one of the woman behind Definition Magazine and see if she had time to do an interview. She made time in her extremely busy schedule to fit me in. I hope you enjoy learning more about her and check out Definition Magazine. I would love for this magazine to get recognition and prove to the world that you don’t have to eat Paleo to have a rockin’ body! How long have you been vegan and what lead you down this path? I’ve been vegetarian since 1996, was an ‘inbetweegan’ for a number of years, and have now been happily vegan since 2012. I could talk about this for days, but the shortest version of what led me down this path is: I love animals. I love my kitties, my dog, and my bunnies. But beyond the fuzzies in my family, I really mean that I love all animals equally. I certainly couldn’t imagine eating my own sweet critters. Nor could I imagine eating or enslaving any other sweet critter, just for the sake of my taste buds. It’s as simple as that. Once I made that realization, there was no going back. Now that I have such a strong commitment to the compassionate lifestyle, I’ve learned that, while I started down this path for the animals, I’m also continuing down the path for the sake of our planet, and for my health. You just launched Sweet Potato: Plant-Powered Health Coaching. Lifestyle coaches are popping up all over the place and I have to admit when I went vegan it would have been great to have that type of support system. Could you walk us through an initial session with you and let the readers know what they can expect with a coach? Absolutely! The first step in my health coaching program always begins with a free health history consultation. Basically, it’s a conversation. We’ll talk openly and honestly about any and all of your health concerns. Through discussions about your nutrition, physical activity, relationships, spirituality, and career, we’ll uncover a deeper understanding of what optimal health means for you and uncover your personal wellness goals. The consultation is your opportunity to speak and be heard, but it’s also an opportunity for me to learn about you, to ensure that your goals are in areas I’m comfortable and knowledgeable. I wouldn’t invite you to be part of my program if I wasn’t confident that I would be a fitting coach for you! After your consultation, we’ll create an action plan designed to help you achieve your goals. We’ll work together to take one step at a time, implementing sustainable lifestyle and behavioral changes designed to improve your life, health, wellness, and energy. Clients in my program receive: Two sessions each month, with regular communication in between sessions. Each session, we’ll discuss goal progress, set new small attainable milestones, and you’ll receive a handout and small gift based on your current personal goals. Also, you’ll be invited to at least one group event each month, such as a workshop, cookbook exchange, potluck, cooking demonstration, or health food store tour! This helps ensure that you’re never alone in the process of your personal growth. Yes, I am a busy lady! But I love it that way. I’m currently running my business Dani Photography, launching my new business Sweet Potato Health, Creative Director for Definition Magazine, fitness instructor at World Gym, yogi, weightlifter, active community volunteer, President of the Dallas Arts Association, Vice President of the Dallas Area Visitors Center, wife, and mom to four rescue critters and one adopted road. When I was reading up on you I stumbled across Cherry City Vegans. What exactly is it and does the name have a special meaning? Cherry City Vegans started simply because: I needed an outlet for sharing pictures of vegan donuts! Haha! Totally serious. See, Sweet Potato Health is my outlet for healthy cooking, whole foods, health coaching, and fitness. But, what about all the super indulgent vegan comfort foods that are, shall we say, not exactly up to my Sweet Potato Health nutrition standards? So, Cherry City Vegans was created. Here in the Willamette Valley, we’re sandwiched in between Portland and Eugene, where you can’t kick a rock without hitting a vegan restaurant. Salem, and the surrounding towns, actually have lots and lots of vegan options, but they can be a little more hidden and hard to find. The mission of Cherry City Vegans is to scout out that tasty vegan goodness readily available in restaurants and grocery stores, to show that becoming vegan doesn’t mean the end of your social life, or your love of food. It’s actually a really exciting time for Cherry City Vegans! Until now, I’ve been the only person behind the page. But I’m now in the initial planning stages of partnering with two other awesome ladies interested in volunteering to share the vegan love! My vision is to grow the page into the hub of local vegan resources and outreach. Keep an eye on the page for exciting updates 🙂 Check out Cherry City Vegans here. Always! April is going to be a fun month. April 17th is my first group workshop: Cupboard Essentials. We’ll spend some time together in the kitchen and I’ll introduce you to the time-saving concept of ‘cooking once and eating all week’ by getting creative with a few staple foods. You may be surprised how much of a variety of meals you can create based on an assortment of the classic staples: beans, lentils, rice, and your favorite fresh veggies. You may be even more surprised to learn how delicious, nutritious, and easy this is! We’ll learn how to soak and cook various beans, rice, and grains, soak and sprout lentils, soak and milk almonds, and of course, cook up some delicate greens and sweet root veggies. Yum. More info on Cupboard Essentials here. That workshop takes place just a few days before this year’s annual US Veg Week! This is the second year I’ve taken it upon myself to plan and promote local VegWeek events. This is what I love to do. Planning events is fun and rewarding, and allows me the opportunity to spread the love of plant-based foods, share knowledge, raise awareness, and pique curiosity. US VegWeek is a nationally recognized weeklong celebration exploring the many benefits of vegetarian eating—for our health, the planet, and animals. After all, with 52 weeks in a year, why not make at least one meat-free? When you take the pledge over on the US VegWeek website, you’ll receive recipes, meal plans, and advice in your inbox, as well as a chance to win a prize pack from Compassion Over Killing! Veggies for the win! So far, I’ve planned a Kick-Off VegWeek Potluck, Cookbook Exchange, and Health Food Store Tour at the Dallas Health & Vitality Center, and a VegWeek Dine Out Event at a restaurant to be determined, based on voting during the week. I plan to come up with some sort of fun giveaway during the week, to give out some of the free entree cards that Veggie Grill sent me in the mail. Thanks Veggie Grill! Learn more about VegWeek here. Anybody interested in helping plan and run some additional events during VegWeek? Other event ideas? Other dine out nights? Get in touch! I’d love to fill up the whole week’s schedule with awesome veggie gatherings! What inspired Definition: Strength & Training for Plant-Powered Ladies? Definition was born from the Facebook group Vegan Ladies Who Lift, which is a private group for vegan women interested in fitness, strength training, and bodybuilding. For those of you who may not know, I’ve traveled down a long path on my health and fitness journey, as a formerly obese junk food vegetarian to a healthy fit vegan. During that journey, I picked up a love for lifting heavy weights and building muscle. My latest personal goal is to continue working on my strength training. Yes, muscle can be built with plants! Definition For Ladies is being put together by lady volunteers. Are they all Oregon based? Are they all vegans? Unlike any magazine online or in print, Definition is a magazine for plant-powered women by plant-powered women. Our team is nothing short of an awesome vegan powerhouse! The six of us are vegan women interested in health and fitness, each also running our own businesses, and creating the magazine on a volunteer basis. Most of us have never met in person, but we’ve already made a great connection with each other. I hope at some point to have an opportunity to meet them all. Or even better yet, do some heavy lifting with them! What can readers expect in future issues of the magazine? Definition features a variety of articles relating to fitness, nutrition, lifestyle, and transformation stories. Our staple columns that will reoccur in each issue include Fuel for your Body and Mind, Snack Attack, #instagramlove, and of course, recipes, bodyweight workouts, and heavy lifting workouts. We plan to publish a new issue each season, four times annually. Our mission statement says it best: Definition is for the woman who is passionate about her health and fitness. We empower women of all shapes and sizes to get off the cardio bandwagon, lift heavy weights, embrace their strength, build their muscles, nourish their bodies, and encourage them to do so with the plant-based vegan lifestyle. 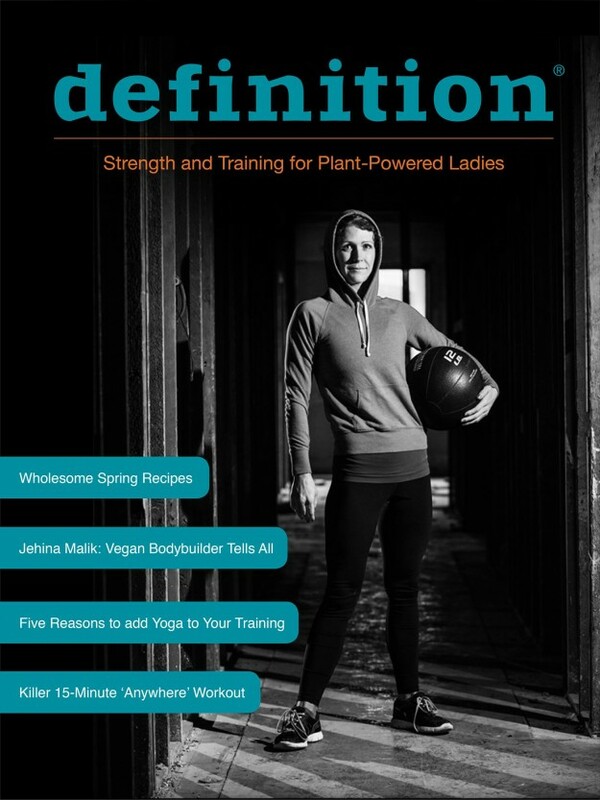 Definition contains insightful interviews with vegan athletes, nutritional guidance, workout tips, fitness gear reviews, positive lifestyle topics, inspirational transformation stories, and of course, recipes for quick and tasty wholesome meals. We provide the framework for building a fit, healthy, compassionate life. In short, Definition is a magazine for strong plant-based women, without the junk—because nobody has time for junk. Also, I read that you would love contributions from others. If people are interested in volunteering, what exactly do they need to do? What type of contributions are you looking for? We are absolutely looking for contributions for future issues. Since we’ll feature a variety of inspiring transformation stories, if you’re a plant-powered lady interested in sharing your story with us, please get in touch! Interested? Learn more here. How do we get a copy of Definition For Ladies and how much does it cost? Here’s the great news: Definition for Ladies is launching as a totally free digital magazine! Issues will be available for download on a number of sites, including Issu, Google Play, and Kindle. The first issue will be available April 2nd! It’s packed from start to finish with all sorts of awesome articles, workouts, interviews, and transformation stories. Connect with our Facebook page for all the latest details! As of the time of this post it is only available on ISSUU or Defintion For Ladies. Links below. Please help make this great resource a success and share with your friends! I am now going to take some time to check Definition Magazine out. Maybe it will lead to the beginning of a new reading habit! Gallery | This entry was posted in Interviews and tagged vegan workout. Bookmark the permalink.